Katz’s Deli must be one of the most famous diners in New York. Granted the first thing that springs to mind for most people is probably Meg Ryan’s virtuoso fake climax in When Harry Met Sally, or perhaps even the less well known appearance with Johnny Depp in Donnie Brasco but Katz’s is about so much more than that. Just as well known for the sheer size of its sandwiches and its fierce traditions, little has changed in the last century. Founded in 1888 (although the sign to the left seemed a little unsure about that) by the Iceland Brothers, Willy Katz came on board in 1903 changing the name to Iceland & Katz. Willy’s cousin, Benny, joined in 1910 helping Willy to buy out the Iceland family resulting in the name that endures today. 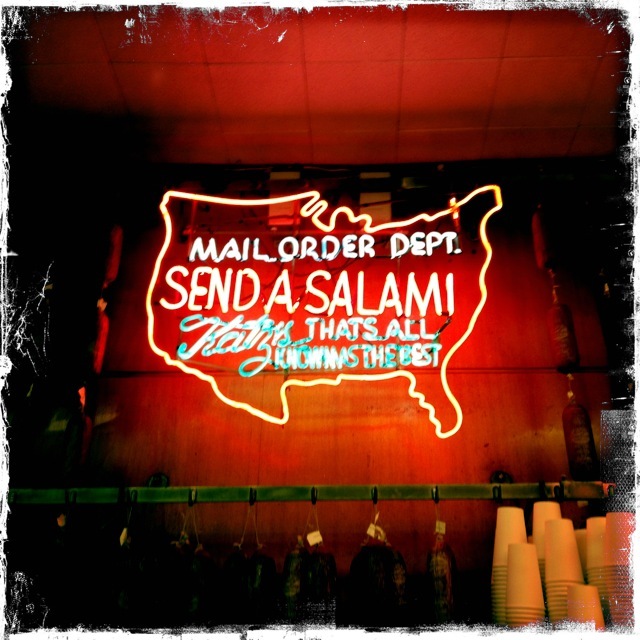 Katz’s began a campaign during the second world war to “Send a salami to your boy in the Army”, a tradition which continues today and is promoted heavily in the store. 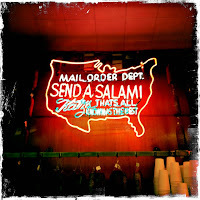 The original family link with Katz’s died out in the mid 1980’s when a local restaurateur, Martin Dell took over (his grandson Jake is the incumbent Pastrami King). Despite the majority of the carvers now seeming to be more of Latin American descent, Katz’s has maintained firm links to its Jewish immigrant history. Matzo balls, knishes, bagels, chopped liver & onions and bialys are all still on the menu but the bulk of the visitors are there for the sandwiches, as was I. So that’s enough of a history lesson, what’s it like now? We grabbed a yellow cab down to the Lower East Side fairly early on a Sunday morning in the hope that queues wouldn’t have backed up too much. A massive, dripping meaticilous sandwich isn’t my usual breakfast but needs must, when in Rome etc etc. Turned out to be a good move as no queue greeted us, unlike half an hour later. I would estimate the split of diners to be about 60% tourist to 40% local but for me that’s still enough to suggest this place isn’t only about its image but still heavily relies on quality and reputation. The locals are of every colour, creed and culture and between them and Katz’s itself, this place is classic New York distilled. Oozing nostalgia, it really doesn’t feel like this place has changed in the last half century. It’s best to know how things work at Katz’s before you arrive. Noone explains things and there is a distinct protocol to follow. On arrival you are presented with two tickets. You hold onto these come what may, penalty for loss being a hefty fine. The left hand strip of tables have the benefit of a plethora of celebrity photos to browse as you munch. You will get waitress service but will lose out on the experience of interacting with the meat men and getting the tasty samples carved off whilst you wait for your sandwich. If you want to opt for a table on the right join one of the multi strand queues to get to the sandwich carving bay. There is very much a no nonsense approach to ordering, make sure you’ve decided what you want before it’s your turn as if you snooze you lose (or at any rate get expressed to you in no uncertain terms quite how irritating your dallying is). Whichever option you go for, your server or carver will scribble on your ticket to indicate what you owe. Once you’ve finally reconciled yourself to the fact that you can’t manage another mouthful, queue up to take your ticket to the till. No cards allowed so make sure you’ve got enough cash. Enough scene setting. Let’s get to what we’re really here for. The Meat. It doesn’t seem to be offered on the menu but I overhead a distinctive New Yoik local accent order a “half and half” just in front of me so decided to follow suit. This resulted in one slab of brisket and one of pastrami meaning my initial prevarication (see above re how to annoy the servers) resulted in getting the best of both worlds. I ordered a dose of American cheese on my brisket just because it would have seemed wrong not to (picture left). 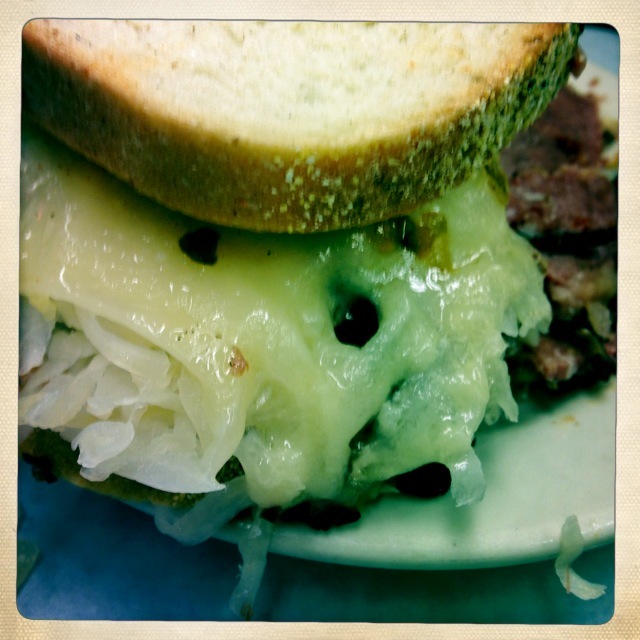 Its entirely up to you whether you have mustard and how much but I’d recommend it, especially a little on the pastrami. The meat itself has a fabulous smoky, peppered flavour but the mustard just seems to enhance that beefy flavour a little bit more. The pastrami is incredible, a blackened outer crust (without any burnt taste) opens out to reveal a fantastic pink colour, if you didn’t know better you’d question how something could naturally be that colour but this stuff is the best. Tender as can be, and really does flake apart. Each bite through the chewy bread, soaking up the oozing meant juice to the burn of mustard and peppering of your taste buds leaves you wanting to come back for more. Each sandwich is accompanied by a plate of pickled vegetables that, whilst not the most attractive dish you’ll ever see, do serve to cleanse the palate & add a texture of crunchy bite to proceedings. Katz’s often cure their meat for up to 30 days resulting in a much more deep rooted, authentic flavour and succulent texture. It is surprising quite how moist the meat is considering that they pride themselves on not injecting brine as part of the curing process (as other delis are reputed to do). This does make me think that heavy basting takes place during the cooking process but this is no bad thing. A opted for a Reuben. From the way she tucked in, I reckon she enjoyed it…. In hindsight, and having stolen a bite, I rather wish I had done the same since, although mine was lovely, the addition of sauerkraut to the sandwich was a good one the vinegared veg cutting through the richness of the swiss cheese. At around $16 a sandwich, these aren’t the cheapest meat and bread combos that you’re ever likely to encounter but considering the content of nearly a pound of meat each they do offer good value for money. Despite the online menu joking that their 3 meat platter feeds “3 tourists or 1 local” you won’t get laughed out of the joint for ordering a sandwich to share. That said you will become overly possessive over your sandwich and reluctant to let anyone else near all that juicy meat. Bearing in mind it’s Lower East Side venue, Katz’s isn’t the most easily accessible location compared to all the tourist jaunts that your average New York visitor will be headed for. That said, its not a million miles from the quirky shops and cafes of Greenwich Village and god knows you’ll need to walk off all that meat afterwards to even make a dent in the bodily damage done by that sandwich! Although we didn’t get to sit on the “Harry Met Sally” table, its probably for the best, I know that I wouldn’t have been able to help myself recreating the notorious scene and that’s good for nobody at breakfast time. Now I really am going to make a long overdue visit to see what Mishkins can offer in Covent Garden. It might not be strictly kosher but hopefully it will bring back happy Big Apple memories!